When Flor Prendergast decided to create a whiskey, he brought in his American friend and spirits maverick, Steven Grasse, who had an idea that required a transatlantic collaboration: whiskey from Ireland, finished in rye barrels from America. They formed Pugilist Spirits to bring this idea to life, with whiskey distilled and aged in West Cork, Ireland and rye barrels sourced by Grasse’s own Tamworth Distilling in the U.S.
Fresh and clean with fruit, floral, and spice notes. Sweet and refreshing up front, followed by a subtle hit of bitterness and a spicy finish. A pale to medium gold colour, bright and clear. Complex, fruity nose reminiscent of melons and mangoes at the forefront, with underlying aromas of fresh green plants. The palate a clean, fresh, and slightly sweet with a smooth, spicy finish. Best served neat, or on the rocks. 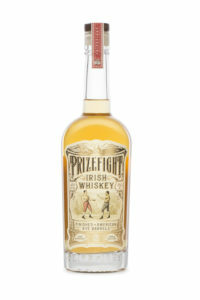 Please use the Product Finder to locate Prizefight in your area.